This post was updated Jan. 15 to include the directions on how to identify traffic by day and hour. What area of your website performed the best in 2013? What was the top performing piece of content or blog post? What was your top traffic referrer in 2013? Top social referrer? What season saw the most engagement? By identifying patterns and determining what’s working best, when it’s working and why it’s working, we can shape our 2014 SEO and content marketing strategy accordingly. 1. Adjust the the date range to Jan 1, 2013 to Dec. 31, 2013. There will be no need to repeat this step in the following reports, as the desired date range will stay in place unless you change it or log out. 2. To access the Content Drilldown report, type “Content Drilldown” in the search bar on the upper left and select the Behavior> Site Content> Content Drilldown report. 3. Once in the Content Drilldown report, be prepared talk about which area(s) of your website saw the most traffic. 1. Type “Behavior Site All Pages” in the search bar on the upper left and select the Behavior> Site Content> All Pages report. 2. Once in the report, look for particular pieces of content that saw major traffic gains. What saw the most traffic? A blog post? An infographic? A landing page? 3. We will also use this report to answer when we saw the most engagement. Switch to a monthly view to assess traffic by month. 1. Type “Acquisition All Traffic” into the search bar to pull up the Acquisition> All Traffic report. 2. Once there, change the primary dimension to medium. 3. Assess what source brought in the most traffic. How do your visitors find you? Though organic search? Paid search? Social channels? 4. This is also where you’ll find data on your traffic by day or hour. Change the secondary dimension to Day of Week Name and Hour accordingly. 1. In an effort to break down which social channels bring in the most traffic, we’ll also pull up the Network Referrals Report. Find it by typing “Acquisition Social Network Referrals” into the search bar. 2. Identify which social platform is bringing in the most the traffic to your site. Are those the platforms you are the most active on or that you’ve optimized? This data can lead to a better understanding of where your audience spends their time socially. Plus … participants will have a chance to win Bruce Clay’s latest book: “Content Marketing Strategies for Professionals.” At the end of #SEOchat, we’ll choose one active and engaged participant who will get a free, author-signed copy. Read more about the book here. 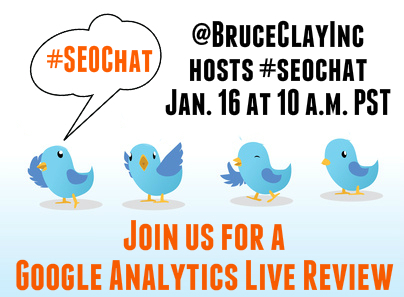 Have a question you’d like to see us address in Thursday’s #SEOChat? Share it in the comments!